20 track label-portrait produced by Lee 'Scratch' Perry, Bunny 'Striker' Lee, & Pete Weston (Micron Music owner) - featured artists include I Roy (with the title track), Jah Stitch, Junior Byles, The Defenders, Joe Higgs, Bobby Ellis, Tommy McCook, U Roy, Blacker Black plus according superlative versions mixed by King Tubby! - the package comes along with the usual excellent graphics, photographs, extensive liner notes and in-depth interviews. The fifty ninth release on Pressure Sounds is due out on the 16th of June 2008. 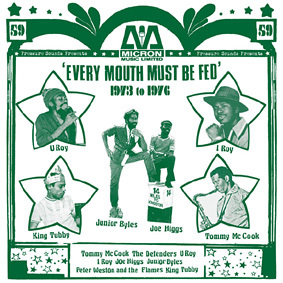 'Every Mouth Must Be Fed' takes its name from an I Roy track featured on the set and one that neatly sums up the ethos behind Micron Records Limited. Their set up, based on Retirement Road in Kingston, Jamaica, gave countless producers and artists a creative opening for their work that otherwise would have been denied to them. 'Conference at Waterhouse… your destination King Tubby's studio' intones Jah Stitch as the album opens with his tougher than tough version to the 'Satta Dread' rhythm followed by some superb vocals from Junior Byles & Joe Higgs, a selection of top talk from deejays U Roy & I Roy, horns led instrumentals from Tommy McCook & Bobby Ellis and some superlative Tubby's mixes that are not only rare but show the dub master at his very best. As usual Pressure Sounds have compiled tracks that offer music fans that little bit extra and have again unearthed some overlooked gems and rare records that will touch your soul. Was there ever a better Jamaican singer than Junior Byles? He's up there with the best of them and 'Lorna Banana' and his interpretation of 'Ain't Too Proud To Beg' are amongst his finest recordings… the highly sought after 'Our Rights' from The Defenders is text book Kingston style vocal harmony with classical sufferers lyrics… I Roy should need little in the way of introduction and is probably the most consistent deejay that Jamaica ever produced. The production throughout is clean and crisp with Lee 'Scratch' Perry, Bunny 'Striker' Lee and the not quite so well known Pete Weston at the helm. Pete was one of the trio of musical entrepreneurs that ran the label. Perhaps Micron is not as instantly recognisable as many of the more celebrated Jamaican labels but any half ways decent reggae collection will be bound to include more than a couple of Micron records. 'Every Mouth Must Be Fed' highlights their work and puts the focus on an organisation that really was important both as a label and as a business. This crackling Pressure Sounds compilation showcases totally re-mastered tracks that present the music at its best and that also comes packed with the usual excellent graphics, photographs, extensive liner notes and in-depth interviews with Pete Weston.